Whilst the USA’s capital is full of extraordinary attractions, iconic monuments and immense museums, there are some amazing experiences to be had as day trips from the Washington DC. The following guide highlights the best day trips from the nation’s Capital, all of which are in easy reach and sure to add to your Washington experience. Just over two hours drive from Washington, DC lies the imposing Monticello, Thomas Jefferson’s architectural masterpiece. Jefferson was the third President of the United States, founding father and principal author of the Declaration of Independence. Originally built as a plantation home, Monticello eventually took the form of a villa. Designed and built by a 26 year-old Jefferson, Monticello offers visitors the chance to explore the house with its fine rooms and exquisite furnishings along with the beautifully laid out flower, fruit and botanical gardens. There is an array of fascinating tours on offer, ranging from behind the scenes, Hemings Family and even privately guided tours. Monticello is well worth the tip out in to the stunning Virginia countryside. Only 35 minutes easy drive from downtown DC, Brookside Gardens is an award-winning garden on display to the public year-round from sunrise to sunset. Spanning fifty acres the property consists of differently themed gardens including the Rain Garden, Aquatic Garden and Japanese Garden to name but a few. Set amongst stunning landscapes with simmering ponds Brookside also offers two conservatories and a fascinating horticultural reference library. This beautiful outdoor garden is also admission free for all visitors. For an inspirational day out head for Baltimore’s National Aquarium, located an easy drive to the north of Washington or otherwise take the Acela Express train - both take around an hour. What is considered to be one the best in the world, The National Aquarium was opened in 1981 and is home to over 20,000 fish, birds, amphibians, reptiles and marine mammals. This world class aquarium house an amazing array of exhibits that include Black Tip Reef, The Living Seashore and The Upland Tropical Rainforest. There are also Spotlight displays on specific species and update displays on the various rescue animals the aquarium cares for. This is also very much an educational experience with focus on human’s impact on the ocean and sea-life and what is being done to combat this. You’ll come away amazed and inspired from a day trip to this this world class, non-profit facility. 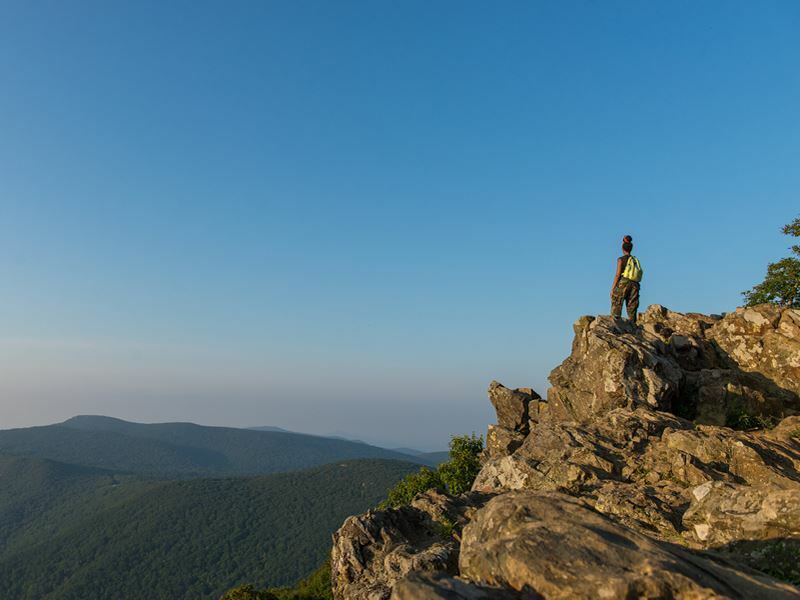 If you’re looking for a memorable outdoor experience then the Shenandoah national Park is the ideal getaway from the hustle and bustle of downtown DC. Set just a 75 minute drive from the nation’s capital Shenandoah National Park nestles alongside the rolling hills of the Virginia Piedmont with stunning waterfalls and amazing outlooks. One of the most popular features is the 105 mile long Skyline Drive, a famed mountain highway running the entire length of the park and offering truly breath-taking views. There are two visitor centres along Skyline Drive packed with great informational exhibits and on hiking, biking and general visitation to the park. Having taken in some of Washington DC’s fabulous museums why not take a drive out of the city to experience first-hand the site of four major civil war battles sites that helped shape the future of the USA. Fredericksburg & Spotsylvania National Military Park is set just an hour from National Mall in the quaint town of Fredericksburg and comprises the sites of four major Civil War battles; The Battle of Fredericksburg, The Battle of Chancellorsville, The Battle of Wilderness and the Battle of Spotsylvania Court House. The park is a lasting testament to the tragedy of war and vividly reflects the impacts and cost to both combatants and civilians alike. There are two, free-to-enter, Visitor Centres on site, along with four historic buildings to explore; Chatham Manor, Salem Church, Ellwood Manor and the house where Confederate General, Stonewall Jackson died. Depending on when you visit there are special events you can experience, such as lectures and artifact preservation workshops. Most states conduct their legislative business in Capitol Buildings but Maryland is one of few that name theirs a State House. Whichever it is, these seats of power are amongst the most iconic building in the U.S. The Maryland State House in Annapolis is no exception, boasting the oldest state capitol still in continuous use. A short 40 minute drive from Washington is state house dates back to 1779, shortly after the U.S. became an independent nation. Whilst there are easy self-guided tours on offer you can also take a fascinating specialized guided tour which is available by special appointment. There is no admission fee and all tours are free of charge. For a fascinating insight into how the rich and famous lived in the late 18th Century then take a tour of the William Paca House and Garden named for its former owner and Maryland Governor - known also for being one of the signatories to the Declaration of Independence. Just a 45minute drive from downtown Washington this house was formerly known as Carvel Hall and is a stunning, historic five-part Georgian mansion. The house has undergone a careful and loving restoration to its former splendor and is considered one of the finest homes of its kind the U.S., now also being designated a National Historic Landmark. The gardens are a two acre oasis of tranquility in the heart of Annapoli’s historic district. Offering up an array of beautifully arranged bricked walls, terraces and parterres the garden’s centerpiece is an ornate summerhouse together with a Chinese style lattice bridge over the tranquil pond below. The gardens have even been stocked with colonial era plants and the kitchen garden provides fresh produce also in keeping with its original heritage. Rounding out any trip to Washington D.C. the underground caves in Luray, Virginia are a great contrast to the urban bustle of the nation’s capital. The Luray Caverns are a registered national landmark and comprise towering stalactites and stalagmites made even more amazing with the dramatic lighting set amongst the formations. The cave walls provide a perfect otherworldly backdrop to some of the awe-inspiring cathedral-sized caverns. Other highlights include an amazing mirror like subterranean lake which further enhances your visual experience, along with a rather gothic like ‘stalacpipe’ organ which taps the surrounding rocks to play notes. 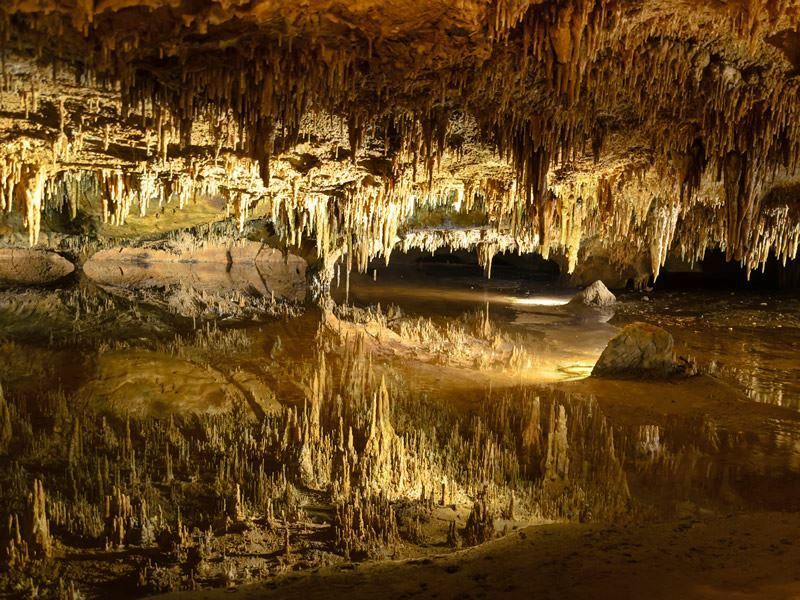 The Luray Caverns can be reached in less than two hour’s drive from downtown Washington D.C.
Awash with cobblestone streets and clapboard townhouses, Old Town Alexandria epitomises 18th and 19th Century American riverfront neighbourhoods. You’ll feel like you’ve stepped back in time when you come across touches like period boot-scrapers and ornate down-pipes. This nationally designated historic district was founded in the mid 1700’s and the place George Washington called home. Highlights to visit include; the Tiny Spite House – the skinniest historic house in America, Gadbsy’s Tavern Museum – which hosted the first five U.S. Presidents, stroll King Street Mile – one of the ‘great streets’ of America. 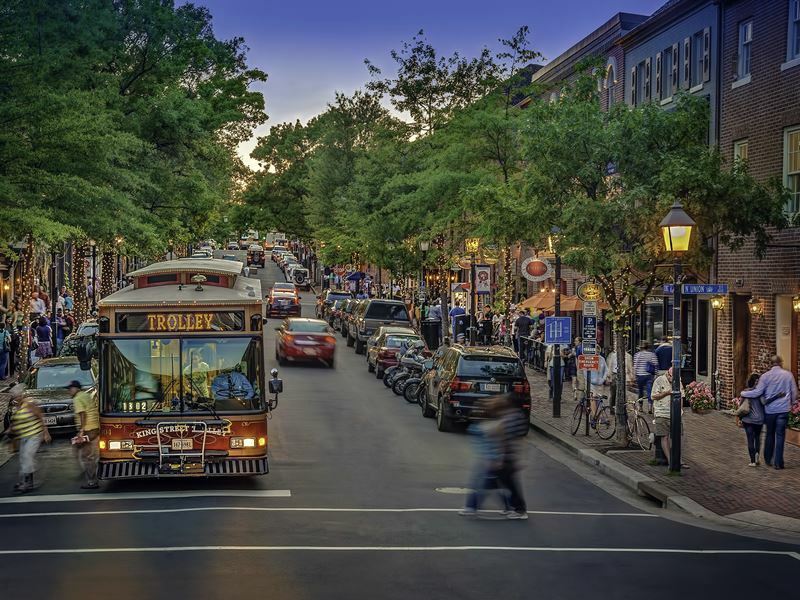 Old Town has an amazing array of bistros and bars to choose from, either on the Potomac waterfront or among the cobblestoned alleys around Kings Street. Old town is a short drive from downtown Washington D.C., but can also easily be reached on Washington’s Metro or by riverboat or water-taxi. Be sure to add the super pretty Old Town, Alexandra to your D.C. experience. 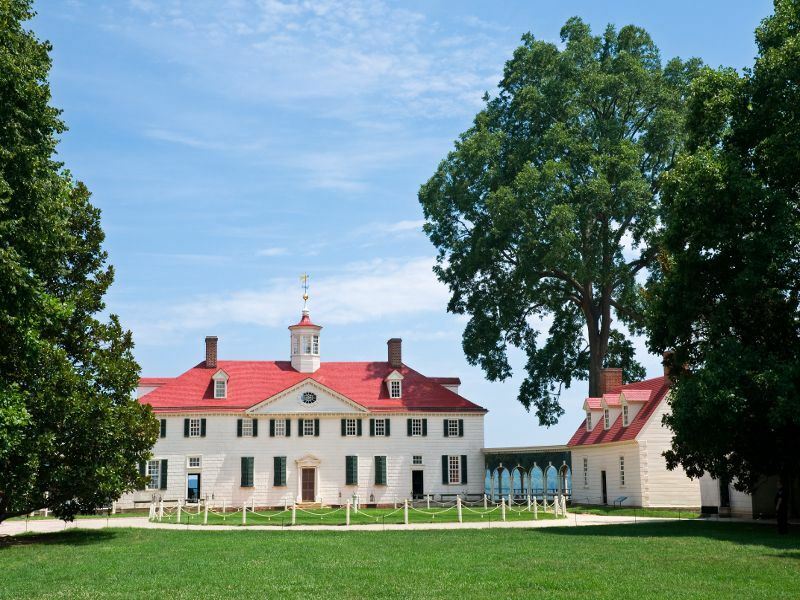 If you have fallen for the ubiquitous history of the Washington D.C. area then whilst you are heading out to Old Town, Alexandria you’ll want to include a visit to Mount Vernon – George Washington’s Virginia home. Just another 10 minute drive on from Old Town, Mount Vernon provides the perfect insight to life on this iconic President’s estate, from the original buildings such as the black smiths shop and spinning house, right down to the tea cups thoroughly rendering Washington’s daily routine. Aside from the mansion itself, must see features of the estate include; the George Washington Museum, Washington’s tomb, the Slave Memorial, the grist mill & distillery as well as the beautifully landscaped floral and kitchen gardens. Why not head out to the tiny seaside town of St. Michaels on Maryland’s eastern shore. Around and hour and a half’s drive from D.C. St. Michael overflows with nautical charm with sweeping harbour views and the marina with is cute rows of sailing yachts. This idyllic waterfront town has just one street running through it – Talbot Street – lined with colourful shops, American flags and colonial architecture. A few blocks away you’ll find the marina, awash with boats and waterside restaurants. Be sure to take the time to visit the Chesapeake Bay Maritime Museum, where you’ll find a sprawling 18 acre campus housing a fleet of historic vessels, a restored lighthouse and rotating exhibits that focus on maritime art, photography and history. Shipwrights restoring historic vessels in the boatyard are more than happy to discuss their project and work in hand. You can also take a boat ride along the Miles River – a bargain at around $10. Sitting on the eastern tip of West Virginia just over an hour’s drive from the bustle of downtown D.C. is the quaint and historic town of Harper Ferry. Well worth the trip for its restored 19th century buildings that line evocative cobblestone streets in the Lower Town area which also neatly acts as an open air museum. The architecture and shops reflect the town’s role as a transportation hub in the mid 1800’s, indeed the town’s location is set where the Potomac and Shenandoah rivers meet and it also marks the mid-point along the Appalachian Trail between Maine and Georgia. Parking is very limited in Harpers Ferry proper, so a great place to start your exploration of is at the National Historic Park Center which offers a frequent scenic ride into downtown. The Lower Town itself is part of the National Historic District and contains many fascinating museums and stores that speak to the town’s history and strategic role in the American civil war. One of the key sites to visit is the old firehouse, now named John Brown’s Fort where the abolitionist, John Brown led a raid on the armoury in an attempt to cause a rebellion to overthrow slavery. The raid failed and John Brown was hanged - but the aftermath is felt to have played a direct part in the start of the civil war. For the active amongst you the thrill of white water rafting awaits along with the chance to canoe or tube on the Potomac. The area is also home to over 20 miles of trails, including of course the Appalachian Trail. Be sure to include Harper Ferry on your list of Washington D.C. day trips – you won’t be disappointed.